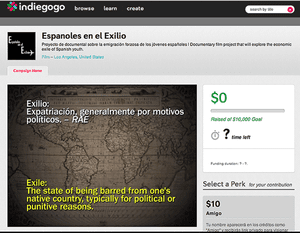 The new crowdfunding campaign for the documentary film project “Spanish Exile” by the young Spanish-American filmmaker based on Los Angeles, Ruben Hornillo is now “live”. Rubén, born in Seville and raised in Jávea, Alicante, graduated with honors from the Polytechnic University of Valencia where he majored in Audiovisual Communication, before heading off to the U.S. to study an MFA in Film and Television Producing at the prestigious American Film Institute de Los Angeles, Ca. His first feature film as a producer, God’s Slave, celebrated its international premiere in June in Venezuela, where it opened to controversy. It subequently premiered in Argentina and Uruguay and has been selected at the Mar de Plata Film Festival, awaiting distribution in Europe and North America. He also produced the short film Goldenstate, which deals with the foreclosure drama in the U.S. and was featured in the official selection at the American Pavilion in Cannes this year. As a young Spanish man living abroad since 2009, Ruben believes in the necessity of telling the story of his generation in Spain, the generation that fulfilled its part of the social contract (study hard, learn foreign languages, study abroad, etc) and has been severely let down. In the first crowdfunding campaign on the Spanish platform Verkami, the project did not meet its fundraising goal and was unable to keep any of the pledges made. It did, however, receive cosiderable media coverage and social media support, convincing the filmmaker to give it another go. 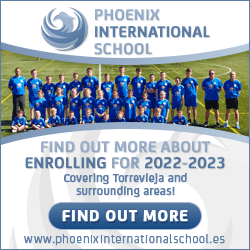 The new campaign is will go live this Monday, 7th October on Indiegogo http://www.indiegogo.com/projects/espanoles-en-el-exilio/x/4371495, and we would appreciate any publicity that would help us reach our fundraising goal and get this movie made. We’d like to invite you to subscribe to our mailing list and receive the latest updates on the Spanish Exile crowdfunding campaign. You can also visit the film project’s website, where you can view the teaser and read some of the testimonies by young Spaniards exiled in different destinations around the planet and here’s the link to the first video of the new crowdfunding campaign. The formal press release is here.